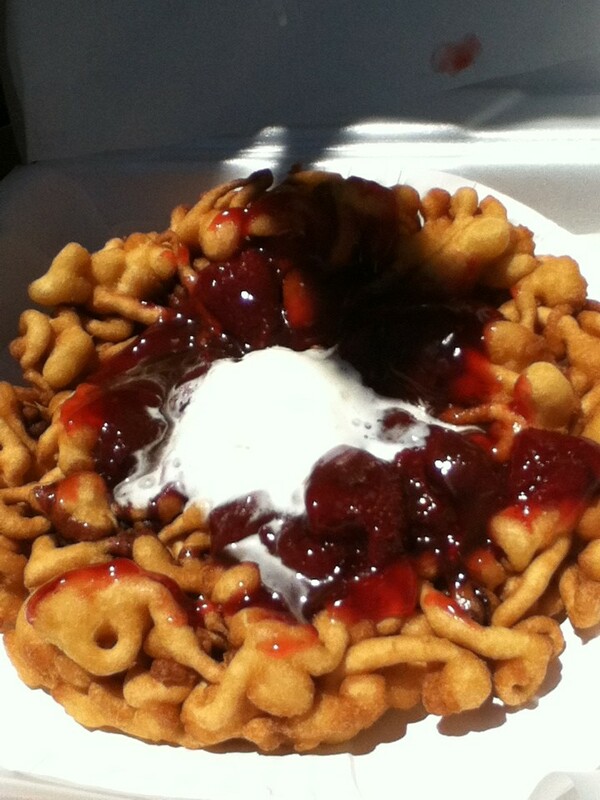 Carpe dough: strawberries and whipped cream on a funnel cake. The fair is back, and with it the deep-fried carny cuisine we love. Oh, don't look like that. All over the world, people of different cultures and creeds are united by a universal love of fried dough. Purists insist on powdered sugar only on their funnel cakes, or else a little cinnamon sugar. Really, it's cousin to the French beignet. Classy. Once you branch out into gooey fruit toppings, whipped cream and "sweet cream," which borders on cream cheese frosting, things get decidedly more lurid. 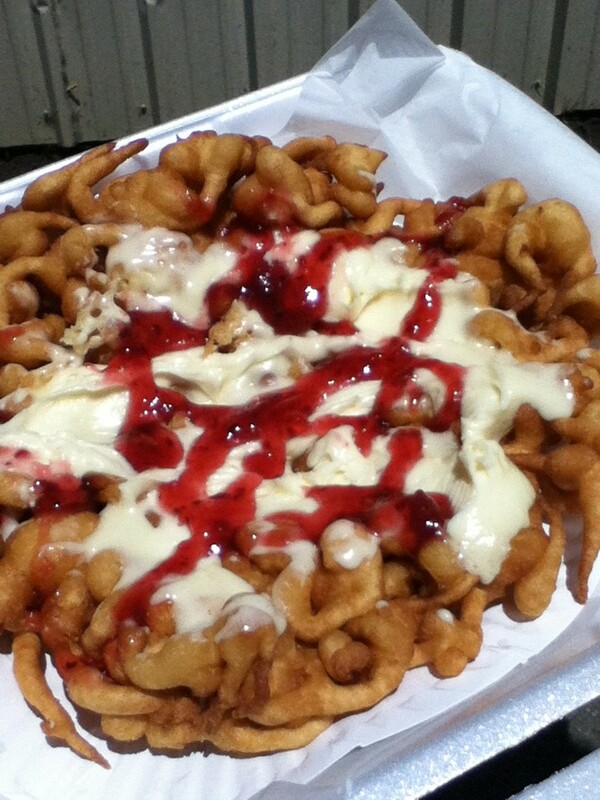 Funnel cake topped with sweet cream and raspberry sauce. A Scottish fish and chips joint claims responsibility for the fried Mars bar. Not to be a flag waver, but how did they beat us to battering and frying a candy bar? No matter — Redwood Acres has done the colonies proud with deep fried Snickers bars, Ding Dongs, Oreos and cinnamon buns. Cinnamon buns. Take that, laddy. 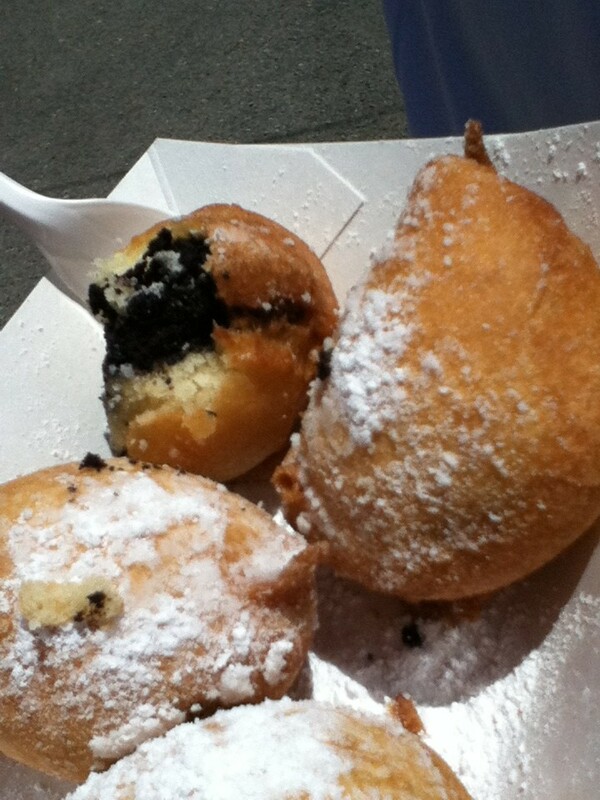 Redwood Acres represent: deep-fried Oreos. Bacon is the new black. It's everywhere and in everything: ice cream, doughnuts, jam, chocolate and anything else you can wrap it around or crumble it over. Nobody's complaining, but the bacon soda available at the fair might be going a beverage too far. Not for the faint of heart, the same stand also offers a 1/4 pound slab of bacon on a stick … wait for it … deep fried and drizzled with your choice of maple or chocolate syrup. Enjoy it with a CPR-certified friend. 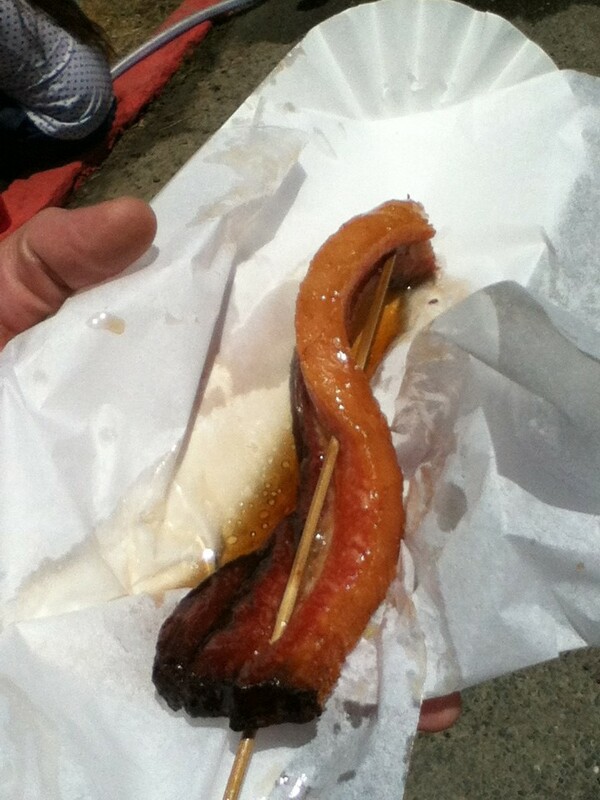 Bacon on a stick is not about presentation.